Andy B Events are pleased to provide DJ Ben for your special party! Andy! wow! I have no words to describe how good ben was at our wedding! 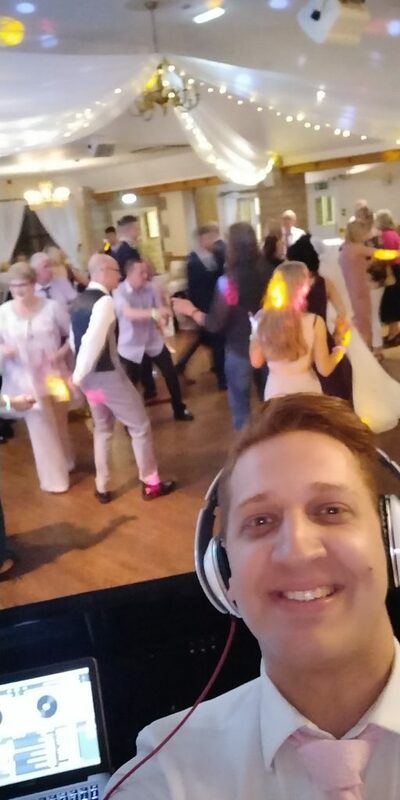 He’s hands down the best wedding DJ ever, just a natural guy who knew what people would like! Ben is based near Blackpool & covers the whole of Lancashire & the North West. All our DJs are professional wedding & party DJs. They bring a modern sound & light show, carry a comprehensive selection of music & will be able to cater for most requests on the night, which is something they’ll encourage. Beforehand, I’d put you in touch so that you can go through specific requests & running order for the evening. You can have as much pre event communication as required to ensure we get it just right on the night. As well as the disco, the DJ will also act as the host for the evening – introducing the first dance etc. Our dress code is normally suit & tie as appropriate the occasion. The DJ there all night & will fit in with how you want your evening to run. But if you do want any suggestions for timings etc, you can discuss it with the DJ.